>I’ve been wanting to switch to cloth napkins for a while, but I haven’t been able to find quite what I’m looking for, nor have I been ready to commit to the initial cost. I’ve also learned about unpapertowels, and I’ve found some really clever containers for them. That is definitely something I want to do when I have the funds. Back to the point of this post! My daughter started a new preschool. It’s 2 days a week, and she eats lunch there. Her new school is very environmentally conscious. In fact, the building constructed last year is registered with the U.S. Green Building Council (USGBC) for certification under the LEED (Leadership in Energy and Environmental Design) program. Needless to say, I’d be ashamed to send a paper napkin and ziploc bag in her lunch box every day! We already have a reusable sandwich container, but I wanted cloth napkins and reusable snack bags too. Enter etsy. 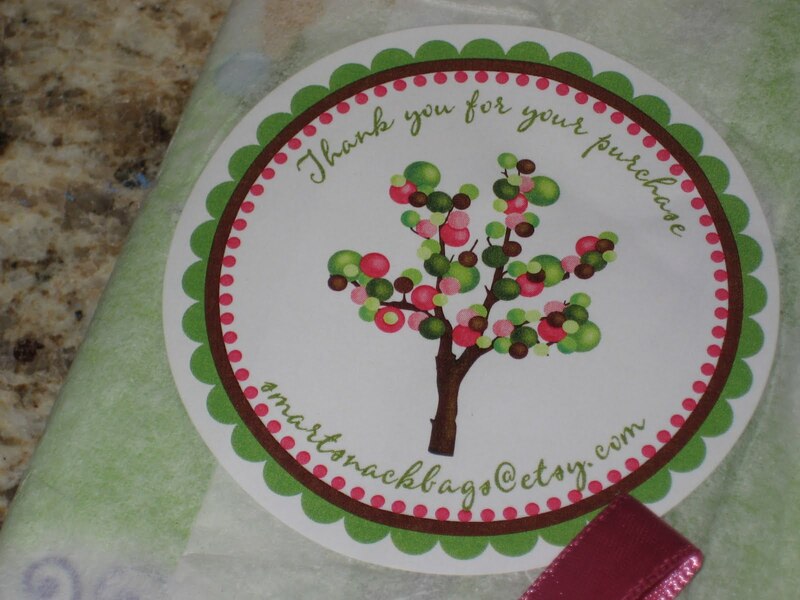 I asked each seller if I could use her photos here on my blog and each agreed. I am trying to learn about photography, but I’m still terrible at it! I thought they were reasonably priced and a worthy investment, considering how much disposable products cost and how quickly they add up. The bags are lined with water resistant, FDA approved materials, so you can even use them for things like sliced fruit. 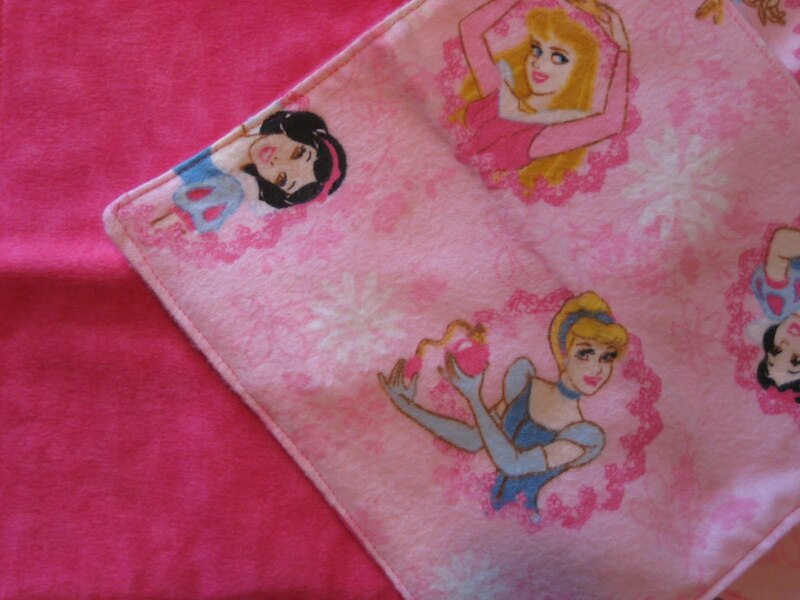 The Tinkerbell bag is about 6.5″ by 6.5″ and the pink bag is about 6.5″ x 3.75″. I thought the larger bag would be great for fruit and the smaller bag would be perfect for smaller snacks like crackers and pretzels. They both have a velcro closure and no exposed seams for crumbs to get tangled in. They can be wiped out or washed & laid flat to dry. If you search, you can find tons of bags in all sizes, prints and closures, to fit any need. Yesterday, I received the pink snack bag. Today I received the napkins. They’re the perfect size for a lunch box! I also got the Tinkerbell bag. She looks a little, uh, confused in the first pic because the bag is creased right through her face. The closure on this one was a little harder to open. My daughter is already planning to take orange slices in it to preschool tomorrow. What made this extra special was the way it was packaged. Even though I knew what it was (and I paid for it!) it was like getting a little present in the mail. The custom sticker was really neat! I’ve already started adding items to my etsy “favorites.” I’d love to have some larger bags with a bottom gusset to pack sandwiches in. I’ve found quite a few adorable prints, but I’m not sure if I should go for a velcro closure, or the traditional fold-over “sandwich bag” closure. Edit August 2010: The napkins held up great, as did the pink bag from cottontopquilts. 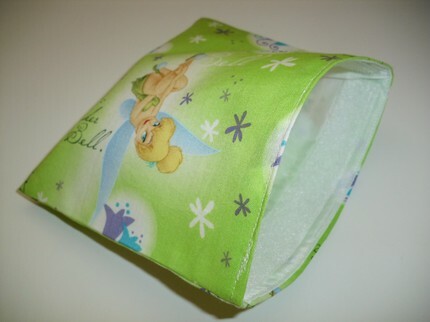 However, the Tinkerbell bag from smartsnacbags didn’t fare as well. We used the pink one 2x/week for 6 months with no problem. 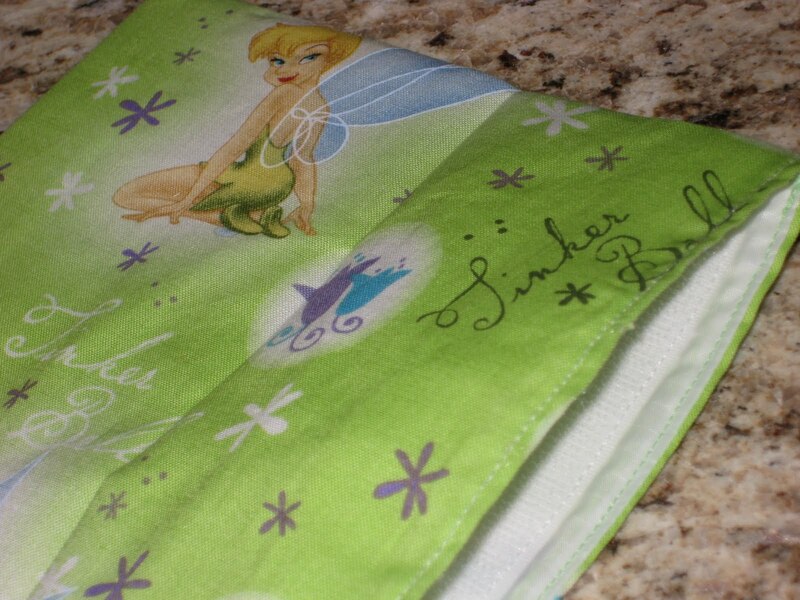 The tinkerbell bag was used less often, maybe twice per month, if that. It didn’t even last 6 months before the lining fell apart, and I received to response from the seller when I contacted her about it.